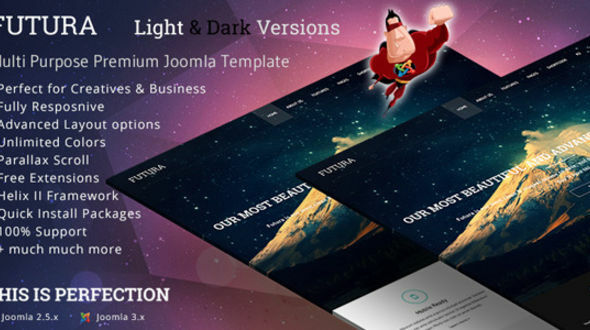 JM Futura is a stunning Joomla template by the Joomlaman team. The template is a multi-purpose professional Joomla 2.5 & Joomla 3 template, with tons of features. With a clean, modern professional design dark and light versions plus unlimited styling options, it is the perfect template for personal portolios, creative agencies, corporate businesses and freelance workers. With its intuative administrator panel, full documation and video tutorials, the template can be easily adapted to suit any size of business including individual, small or large corporations. The template is fully loaded with extensions and features to help you create a stunning and slick creative, business, corporate or ecommerce website. Using the JM Deluxe Layer Slideshow you can easily create stunning animated slideshows. The template boasts parallex modules, K2, animated scrolling animation plus much more to give the template a slick creative edge. Using the latest Bootstrap, Helix II framework and FontAwesome you will find it easy to manage the styling and colors of your site, whilst having full control over the modules and module positions.